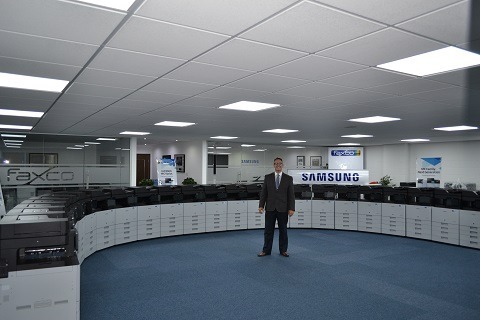 How long have you been working in partnership with Samsung and why did you start working with them? We started working together back in 2014. We initially made the move because of their impressive product line-up and because of the name, which carries a lot of clout in terms of global appeal. I guess our partnership really took off when we fully engaged with the launch of the MX4 Series, which was the first of the SMART, Android-based devices to make it onto the market. We knew it was coming and we decided to really get on board to see what the fuss was about! It worked out well and our partnership has been developing ever since. Has the partnership – and the print-related products being delivered by Samsung – helped you to grow your business? Absolutely, 100%. Samsung’s ability to be flexible in terms of product development and meeting our needs has been brilliant. When we need something to be developed for the product or the ability to be able to adapt to app-based technology, which the Samsung devices centre themselves around, has been really helpful. For example, we had an enquiry about a particularly large order that the Samsung hardware was perfect for, apart from one feature that existed on another manufacturer’s range but not on Samsung’s. We told them, they went away and made it happen, and we subsequently won that order and further business on the back of it. They do listen, they’re open-minded about feedback, because it makes commercial sense and, sometimes, common sense! They also respond quickly, which is clearly important. The speed and flexibility is paramount when it comes to demonstrating to customers how we can make things happen. There might be a glitch that needs sorting or, as I said earlier, a feature that needs adding, and we can talk from experience about how it will be sorted. My experience with other manufacturers is that they’re very fixed and staid, whereas Samsung has a greater degree of flexibility and will make things happen on your behalf. The scale of the business clearly helps, and it’s great for a dealer like us to benefit from the resource of a huge global player. Don’t get me wrong, it hasn’t been a walk in the park and there have been niggles as we developed our understanding of each other – it would be wrong if there wasn’t – but they have stepped up to the mark when required. Very few manufacturers can do it – too often boxes just roll off a production line with fixed features, rather than tailoring machines to do what our customers want them to do. Do you think the Android ecosystem and its scale helps with this? It does indeed. When you’ve got an operating system like that, which is tried and tested, running some of the business-critical apps, it has to help. It also makes it simple for Samsung to code and recode and access knowledge, whereas if it’s a device running on a manufacturer’s own firmware designed just to perform the device’s tasks there’s little or on flexibility. Does this flexibility help you to cater for new ways of working and therefore sell more effective solutions? When we present to potential customers we pretty much know, rigidly and fixed, what every other manufacturer has to offer. Samsung’s SMART devices, the clever technology and the flexibility it affords is without doubt a huge plus point for us, which has been demonstrated by us winning so many tenders over the past few years. Plus, it’s worth mentioning that Samsung’s interface, which is tablet-based, means customers get it straight away! As soon as they see it, users say ‘wow, it’s just like a big tablet!’ and start getting to grips with the features immediately. Most people have a smartphone and/or tablet, so they can use the machine. We always say to customers, ‘imagine everything you can do on your Samsung Galaxy tablet, all the apps, all the control, all the features, now imagine this on your copier/printer’. Collectively, the Samsung name, the technology inside and the tablet- or phone-style user friendliness gives us a compelling proposition that people get. It’s as simple as that. All-in-all, would you say the decision to partner with Samsung has been a good one? Without doubt. We’ve been Samsung’s top Scottish dealer two years in a row and I believe we’ll continue to be so again this year. That says it all.